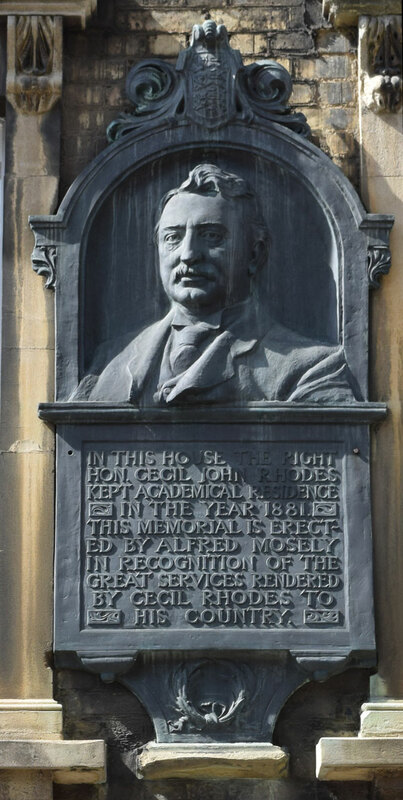 This bust of Cecil John Rhodes (1853–1902), with the above inscription underneath, was erected in 1906 by Alfred Mosely, a former Cape diamond merchant and associate of Rhodes. It is on the outside wall of 6 King Edward Street (which is owned by Oriel College), high up between two first-floor windows. Rhodes was matriculated at the University of Oxford by Oriel College on 13 October 1873 when he was aged 20, but returned to South Africa for health reasons after only one term. He came back to Oxford in 1876 and lived first at 116 High Street and then here at 6 King Edward Street, obtaining his B.A. and M.A. pass degree simultaneously in 1881 at the age of 28.